Hi! Welcome to our little world of quilting, sewing and crafting! 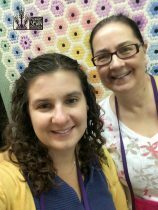 We’re a mother-daughter team, collaborating across the country (Nebraska to California) to create sewing and quilting patterns. We also run Acraftability, an accounting group for crafters. A retired research scientist, Linda has been sewing since childhood. She grew up sewing her own clothing and was introduced to the art of quilting by her mother-in-law in 1986. Linda loves learning new techniques, playing with new gadgets and experimenting with fabric. An avid “collector” of fabric, she enjoys the opportunity to sew, quilt and create with her daughter, Laura. Her favorite aspect of creating fabric bowls and vases is drafting the new patterns and experimenting with different techniques to achieve the desired result. Her best ideas come to her in the middle of the night, and she can frequently be found in her sewing room at 4 a.m. when genius has struck. Linda lives in Omaha, Nebraska, with her husband, who is also a retired research scientist. Laura lives in San Francisco, California where she works as as a project manager for a technology company. Although she dabbled in sewing and quilting during her childhood, she didn’t begin creating in earnest until her sophomore year of college. Her first true project was inspired by a visit to her grandmother’s quilter in Amish country. Under the tutelage of both her grandmother and mother, Laura completed her first small wall hanging and began looking to the next challenge. She loves the opportunity to quilt and create with her mother, and looks forward to their frequent mother-daughter trips to quilt shows across the country. Prairie Sewn Studios is a participant in the Amazon Services LLC Associates Program, an affiliate advertising program designed to provide a means for sites to earn advertising fees by advertising and linking to amazon.com.